Cerebral infarction after stroke. Coloured gamma scan (scintigram) of the brain showing infarction of the temporal lobe (gap in red ring at lower right) after stroke. The scan shows concentration of a radioactive tracer in a horizontal "slice" through the brain. 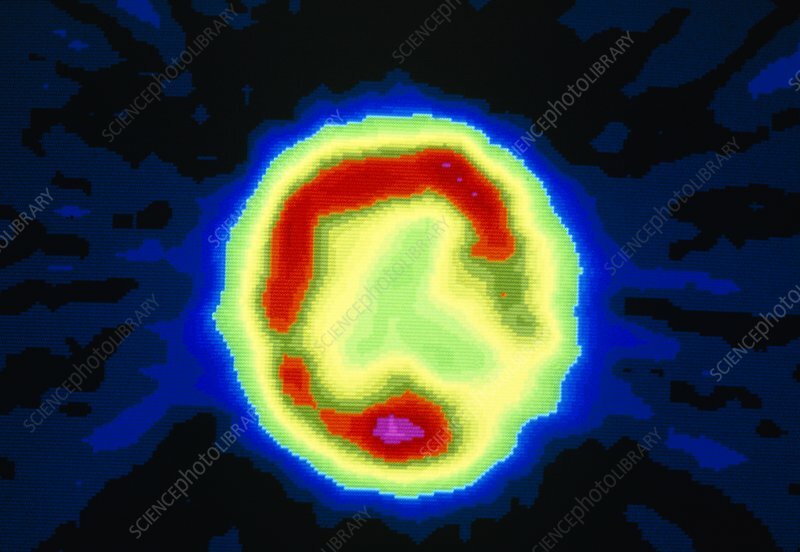 Red represents areas of high radioactivity (normal tissue); blue and green show areas of low activity. Infarction is the death of tissue due to obstruction of its blood supply. The usual cause of infarction in the brain is blockage of an artery by a clot or embolism (a solid fragment carried in the blood), or rupture of an artery. The resulting nervous disturbance, called a stroke, is often debilitating or fatal.